The core of Vaporsens chemical sensor technology is a net of nanofibers that are approximately one thousand times smaller in size than human hair. Large surface areas and highly porous structures enable nanofiber sensors to deliver rapid response (seconds) and high sensitivity in the parts per billion and parts per trillion ranges. 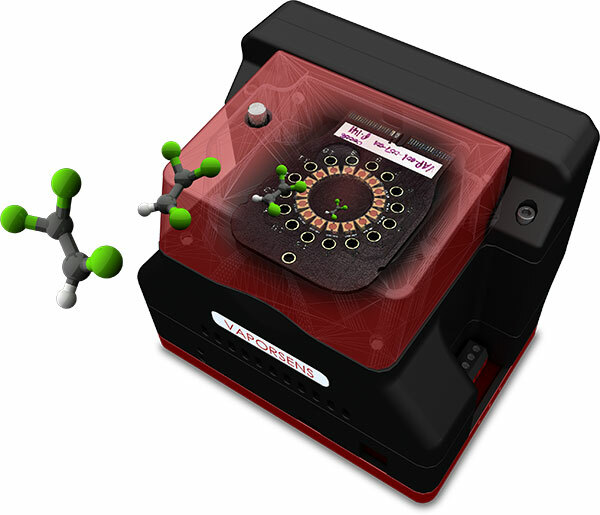 Ambient air, headspace, or other gaseous samples can be measured for target chemicals. A sensor array of different nanofibers creates a fingerprint for target chemicals of interest. By customizing the rapid-response sensor arrays to detect specific chemical targets, Vaporsens can provide highly sensitive and selective chemical sensor solutions for users in many markets. Vaporsens chemical sensors are reliable, portable, durable, low power and capable of detecting a wide variety of chemicals, including industrial chemicals, explosives, drugs, VOCs, TICs, amines and more. This website is designed to communicate with you the best ways to engage with Vaporsens to explore use of this technology to create solutions for your applictions. Test our prototype. Share your results. Vaporsens works with research institutions and companies on grant and contract funded projects to discover solution feasibility for a broad range of chemical sensor applications ranging from explosive detection to food spoilage.